Norwegian has been named ‘Best Best Low-Cost Carrier in Europe’ at the prestigious 2019 Passenger Choice Awards™. The APEX Passenger Choice Awards represent one of the highest accolades in the industry as winners are directly voted for by passengers and take into account factors such as seat comfort, cabin service, food and beverage, entertainment, and Wi-Fi. Norwegian is proud to unveil its newest tail fin hero, and eighth American to be immortalised on a Norwegian aircraft: civil rights leader, Harvey Milk. His portrait graces the tail fin of a Norwegian Boeing 787 Dreamliner aircraft. 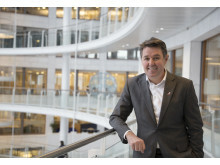 Norwegian’s Nomination Committee nominates Niels Smedegaard as the company’s new Chair of the Board. Arctic Aviation Assets DAC, a subsidiary of Norwegian Air Shuttle ASA ("the Company"), is pleased to announce that it has reached an agreement with Airbus S.A.S. for the rescheduling of part of the order book, including both A320neos and A321LRs. The rescheduling is a result of a dialogue between the Company and Airbus the past months. The postponement is expected to reduce the Company’s capital expenditure commitments by approximately USD 570 million in total for 2019 and 2020. The postponements are in line with the Company’s strategy of capitalizing on the scale built up over the last few years and the changed focus from growth to profitability. This announcement is an extension of the information provided in the stock exchange announcement “Norwegian strengthens its balance sheet through a fully underwritten rights issue of NOK 3 billion” on 29 January, where postponement of aircraft deliveries was highlighted as a measure to reduce capital expenditures, in addition to aircraft divestments. Norwegian is a listed company on the Oslo Stock Exchange and is the world's fifth largest low-cost airline operating 500 routes to 150 destinations in Europe, North Africa, Middle East, Thailand, Caribbean, the U.S and South America. In 2018, Norwegian carried more than 37 million passengers. Norwegian has 11,000 employees and a modern, environmentally friendly fleet of more than 150 aircraft with an average age of 3.8 years. Norwegian has been voted ‘Europe’s best low-cost carrier’ by passengers for six consecutive years at SkyTrax World Airline Awards from 2013 - 2018, along with being awarded the ‘World's best low-cost long-haul airline’ in 2015, 2016, 2017 and 2018. 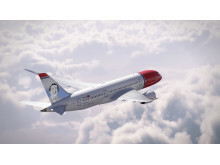 ​Arctic Aviation Assets DAC, a subsidiary of Norwegian Air Shuttle ASA ("the Company"), is pleased to announce that it has reached an agreement with Airbus S.A.S. for the rescheduling of part of the order book, including both A320neos and A321LRs. Norwegian carried close to three million passengers in March, an increase of five percent compared to the same month previous year. The figures are not directly comparable with the same month previous year due to the “Easter effect”. Norwegian is delighted to commence its first-ever route between Europe and Canada this weekend by revealing the top five reasons to visit its newest destination this summer. 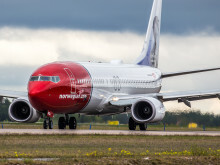 In response to the suspension of Boeing 737 MAX operations by European aviation authorities, Norwegian would like to provide further information to customers booked to travel from Cork, Shannon and its new route from Dublin to Hamilton from 31 March. 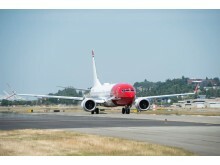 Norwegian has worked continuously since the grounding of the Boeing 737 MAX to ensure that customers travel plans can continue with minimal disruption. The airline has re-routed customers and offered passengers the chance to rebook or receive a full refund free of charge if they no longer wish to travel.The airline is also combining flights and reallocating aircraft within its own network to keep cancellations to a minimum and minimise inconvenience for its customers. 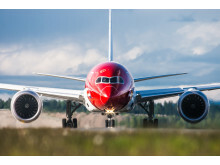 Norwegian has temporarily deployed a Boeing 787-9 Dreamliner to operate daily flights between Dublin Airport and New York (Stewart). The service combines the Dublin to New York and Providence flights and bus transportation has been arranged for passengers travelling onward to Providence. From 31 March, Norwegian can confirm that it will temporarily operate additional services from Dublin Airport using a Boeing 737-800. The ETOPS-certified 737-800, which enables the aircraft to fly an efficient direct-routing, will operate the Dublin to Hamilton route, four times per week on Monday, Wednesday, Friday and Sunday. The aircraft will also be used on flights between Dublin and Providence on Tuesday, Thursday and Saturday. Customers travelling from Shannon to New York (Stewart) and Providence have been transferred to flight D8 1763 on Norwegian’s Dublin to New York (Stewart) service using the Boeing 787-9 Dreamliner. Passengers travelling from New York (Stewart) and Providence to Shannon have been re-accommodated on flight D8 1762 from New York (Stewart) to Dublin on the Boeing 787-9 Dreamliner. Norwegian has arranged bus transportation, departing at 9:30am, for customers at Shannon Airport to arrive at Dublin Airport Terminal 2 at 12:30pm to meet their flight. Customers travelling on 31 March can also benefit from the bus service. Buses will also meet arriving passengers at Dublin Airport’s coach park at 8:30am for those travelling to Shannon. Customers booked to travel from Cork to Providence on flight D8 1821 have been transferred to flight D8 1823 from Dublin to Providence serviced by a Boeing 737-800. Those booked to travel on flight D8 1820 from Providence to Cork have been re-accommodated on flight D8 1822 from Providence to Dublin on the Boeing 737-800. Norwegian will also arrange a bus service for passengers from Cork Airport to Dublin Airport to meet their onward flight. The bus departs at 9:00am arriving at Dublin Airport Terminal 2 at 12:30pm. Customers arriving at Dublin for Cork will be met upon arrival with a bus at the coach park outside Terminal 2 at 8:00am. Affected customers have been contacted by SMS text messages which include their options to rebook or receive a full refund. Norwegian’s brand-new service from Dublin to Toronto’s Hamilton airport will operate as normal using a Boeing 737-800 from 31 March. Customers booked on flights D8 1840 from Dublin to Hamilton and D8 1841 from Hamilton to Dublin will be able to travel on the airline’s newest route for the start of the summer season, four days per week. Norwegian continues to temporarily withhold further sales of all routes operated by the 737 MAX to ensure the airline can meet customer expectations in light of the suspended operations of this aircraft. The airline is actively working on more permanent measures to operate normal services from 11 April that will minimise inconvenience for customers and will provide updates to customers in due course. 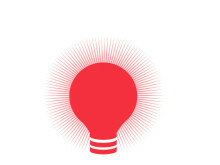 Reference is made to the stock exchange announcement from Norwegian Air Shuttle ASA (“the Company”) on 12 March. Following recommendations by European aviation authorities, Norwegian temporarily suspended flights operated by the Boeing 737 MAX. This blossoming tourist destination will delight your senses in a myriad of ways. With a mix of modern architecture and historic monuments, it is often referred to as the most charming city in Scandinavia. Do you know what city we are talking about? Thank you for voting us ‘Best Low-Cost Carrier in Europe’ at the prestigious 2019 APEX (Airline Passenger Experience Association) Passenger Choice Awards™! Norwegian is a listed company on the Oslo Stock Exchange and is the world's fifth largest low-cost airline operating 500 routes to 150 destinations in Europe, North Africa, Middle East, Thailand, Caribbean, the U.S and South America. In 2018, Norwegian carried more than 37 million passengers. Norwegian has 11,000 employees and a modern, environmentally friendly fleet of around 170 aircraft with an average age of 3.8 years. Norwegian has been voted ‘Europe’s best low-cost carrier’ by passengers for six consecutive years at SkyTrax World Airline Awards from 2013 - 2018, along with being awarded the ‘World's best low-cost long-haul airline’ in 2015, 2016, 2017 and 2018.